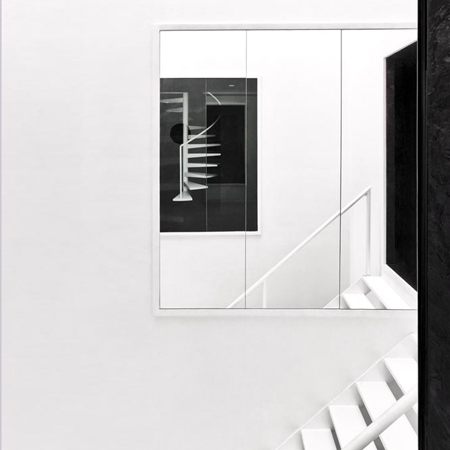 Brussels studio Label Architecture have transformed the interior of a family house in Brussels, Belgium, by covering some walls in rough, black-stained oriented strand board and painting others white. Called Fiat Lux, the project involved replacing the existing staircase with a white metal one. Mirrors and circular apertures in the walls allow glimpses into other areas of the home. It consists in the transformation of a 270 m² family house. A punctual intervention, centred on the heart of a traditional house in Brussels, gave to this dwelling an outstanding character. Transparency, reflections and connections between the different levels determine the daily routine of the large family living in. From the first floor, the stairwell was entirely emptied on the three higher-ups levels. A staircase in openworked metal links together the two first floors. At each level, glazed windows were handled with care, on all the height of the dividing wall, bringing a real physical feeling, not so far from vertigo. Some of them are pierced by little round openings, allowing inhabitant to communicate from a level to another one. Behind the windowpanes, the platforms, transitions spaces, were covered by OSB stain in black, creating a mirror effect to those who look at them from the opposite openings. In front of this openings, mirrors were installed on the blind attached wall. The family benefits the unexpected connections of this surprising arrangement, worthy of Lewis Caroll.